Newcastle is a small seaside resort in County Down, Northern Ireland, which had a population of 7,444 at the 2001 Census. It lies on the Irish Sea at the foot of Slieve Donard, one of the Mourne Mountains, and is known for its sandy beach and the Royal County Down Golf Club. The town lies within the Newry, Mourne and Down District Council area. View from main street in Newcastle towards Slieve Donard, the highest peak of the Mourne Mountains. The town aims to promote itself as the "activity resort" for Northern Ireland and its most special attribute is its location at the foot of Slieve Donard. The town has benefited from a multi-million upgrade which makes it a high quality seaside attraction. The town is twinned with New Ross, County Wexford, in the Republic of Ireland. The name of the town is thought to derive from the castle built by Felix Magennis of the Magennis clan in 1588, which stood at the mouth of the Shimna River. This castle was demolished in 1830. The town is referred to as New Castle in the Annals of the Four Masters in 1433, so it is likely that he built on the site of an existing structure. In the 17th century Ulster ports began to rise in prominence. In 1625 William Pitt was appointed as Customer of the ports of Newcastle, Dundrum, Killough, Portaferry, Donaghadee, Bangor and Holywood. The Montgomery Manuscripts record that Newcastle was besieged and later captured by Sir James Montgomery of the Ards in April 1642 in the aftermath of the 1641 Rebellion (pp. 128–134). Prior to 1641 the Castle belonged to the Magennis', but after the rebellion the property was confiscated and granted to Robert Hawkins, great grandfather to Robert Hawkins who assumed the surname of Magill. The date 1588 was inscribed on a stone placed over the front entrance of the Castle, built by Felix Magenis. Newcastle passed from the Magills to the Mathews, and subsequently to the Annesleys. In the late 1700s the Castle was modernised by the Matthews and then the Annesleys, and rented by the Board of Customs for the accommodation of revenue officers. Around 1830 the castle was demolished and the 'Annesley Arms Hotel' was constructed within the original castle compound. The 3rd Earl Annesley built a new 'marine residence', called 'Donard Lodge' on the lower mountain slope above the town (it was demolished in 1966). St. John's Church was also opened on 'The Rock' in 1832 to accommodate the visitors and growing population in Earl Annesley's developing seaside resort. On 13 January 1843, boats from Newcastle and Annalong set out for the usual fishing stations, and were caught in a gale. 14 boats were lost in the heavy seas including a boat which had gone to the rescue. Only two boats survived, the Victoria and the Brothers. 76 men perished, 46 of whom were from Newcastle. They left twenty seven widows, one hundred and eighteen children, and twenty one dependants. A Public Subscription was raised and the cottages, known as Widows Row, were built for the widows and dependants. A local song about the disaster says "Newcastle town is one long street entirely stripped of men"
In 1910 Harry Ferguson flew a small plane across Newcastle beach in one of the first engine powered flights by aircraft in Ireland. He completed the flight in an attempt to win a £100 prize offered by the town for the first powered flight along the strand. His first take off ended badly, but according to a modern newspaper report 'He flew a distance of almost three miles along the foreshore at a low altitude varying between fifty and five hundred feet'. This event is recorded by a plaque on the promenade. The town's history is poorly recorded and is held mostly by local people and their stories of the past. Information on the town is available on signs throughout the forests and hills. The Mourne Mountains is the setting for many local myths and legends. There are stories of 'The Blue Lady', a woman abandoned by her husband whose ghost still haunts the mountains, and more recently the idea of a wild cat living in the Mournes. Many of the stories although have true origins are only folklore and give many of the towns attractions their names, such as Maggie's Leap being named after a local girl called Maggie, who leapt over the impressive chasm to her death while fleeing soldiers with a basket of eggs. Many other places in the Newcastle area get their names from other sources, 'The Brandy Pad', a path through the mountains, is named so because of the illegal brandy smuggling that took place through the area. Another example is Bogey Hill just above the harbour at the Southern end of the town, which is named after the carts that carried Mourne granite from the quarry on Thomas' Mountain down to the harbour. In 1897, T.R.H. The Duke and Duchess of York (the future George V and Queen Mary), grandparents to Queen Elizabeth II, visited Newcastle to open the Slieve Donard Hotel. Afterwards they visited Hugh Annesley, 5th Earl Annesley at Castlewellan Castle. A process of preserving the local history has begun since 2014 via a community Facebook page 'History of Newcastle, Co. Down'. Photographs and information on the area's history are being collected via the page, and a history of the town will be published. Greater historical detail about the town will be added to this page as part of this research process. It is hoped that this collective history will enhance the experience of both locals and tourists by promoting an informed historical appreciation for the area. Newcastle was fortunate enough to escape the worst of the Troubles and its residents both Catholic and Protestant lived in relative peace with each other though there has been considerable objection to loyalist band parades in the town. 23.5% were aged under 16 years and 21.7% were aged 60 and over. 47.4% of the population were male and 52.6% were female. 69.3% were from a Catholic background and 28.4% were from a Protestant background. 62.4% of people identified as Catholic, 22% identified as belonging to another Christian denomination, including Presbyterian, Church of Ireland and Methodist. 15.4% of people gave their religion as none or did not answer the question. Other Protestant denominations in the town include Baptist, Brethren and Elim Pentecostal. 4.1% of people aged 16–74 were unemployed, 28.9% of whom were aged 16–24 and 37.4% were long-term unemployed. Wholesale, and retail trade and repair of motor vehicles was the largest area of employment (16%) followed by health and social work (14.6%). Newcastle is a popular seaside resort and attracts visitors from elsewhere in Northern Ireland and from abroad. In 2007 the new promenade won a number of National awards including a Civic Trust Award for Excellence in the Public Realm. In recent years the town has started a large Halloween festival, with a carnival-like atmosphere. The free event includes fireworks and a fancy dress competition. Crime Rate in Newcastle remains relatively low, although there is a stronger police presence during holiday times due to the increase in petty crimes. Newcastle is home to Northern Ireland's highest mountain, Slieve Donard, which is in the Mourne mountain range. Visitors come to walk in the Mourne Mountains, made famous by the song by Percy French. Another popular attraction in the town is Royal County Down Golf Club (venue for the 2007 Walker Cup and 2015 Irish Open), now recognised as the No.1 Golf course in the world, and is said to be one of Tiger Woods' favourite golf courses. The town is also known for Mourne Granite, which was quarried here for many years and shipped all round the world. It was used to make paving stones in many cities including London and New York. Mourne granite is also being used to make the base of the 9/11 memorial in New York. Sandy beach and Dunes, 2 miles north from Newcastle. Widows' Row. This is a terrace of twelve small houses built by public subscription to house the widows and orphans of 46 fishermen lost in the storm of 1843. The Mourne Mountains lie south of the town and the local area includes the Tollymore Forest Park and Donard Park. The Shimna River flows through Tollymore Park and enters the sea at Newcastle. The Murlough Nature Reserve is situated between Dundrum and Newcastle. The rugged sand dunes and beach are National Trust property. Slidderyford Dolmen is a neolithic portal tomb located near the entrance to Murlough Nature Reserve. It is composed of four stones, two granite and two slate. Saint Patrick's Stream – in popular mythology, the Mourne Mountains was the site where Saint Patrick banished the 'snakes' from Ireland, and that in his first landings to Ireland he visited the Mournes and even converted the local hill folk to Christianity. The small stream is said to mark the boundary of the Kingdom of Mourne and legend has it that there is a rock in the stream with his hand print in it where he knelt down to drink the water. Newcastle Harbour – In the 1820 Lord Annesley created a pier as a loading point for the famous Mourne granite. The Bloody Bridge – The bridge and the Bloody Bridge River, were so named because of an incident during the 1641 Rebellion, during which a massacre of Protestants took place. The bridge is sometimes visited by tourists who go to see the 'Brandy Pad', called after the trade of illegal brandy which was smuggled down this route and from there onwards at the dead of night to Hilltown. The remains of an ancient church and the old bridge which once carried the coast road can still be seen. Widows Row. A set of listed cottages just south of the harbour, built by public subscription after the Newcastle Fishing disaster of 1843. There is one post-primary school in Newcastle, Shimna Integrated College, founded in 1994 as an all-ability, non-selective, 11-18 school. There are four primary schools. St. Mary's Primary School was formerly St. Mary's Boys Primary School and St. Mary's Girls Primary School. The school became mixed in September 2001 but remained split over the two sites, younger children at one and older children at the other until recent years. A new building, large enough to support all the students has since been built. All Children's Primary School was founded in 1986 and was the first primary school outside Belfast that was fully religiously integrated. The other two schools are Newcastle Primary School, founded in 1962, and St. Joseph's Primary School, founded in 1838. There is also a Technical College in the town. Newcastle F.C. plays in the Northern Amateur Football League. Newcastle railway station began operating on 25 March 1869 and closed on 2 May 1955. The Belfast & County Down Railway Station and Clock Tower is a B1 listed, red brick building, built in 1905; It is currently a Lidl supermarket. The Great Northern Railway of Ireland Station Building is used by Ulsterbus, which runs buses to the Europa Buscentre next to Belfast Great Victoria Street railway station in Belfast, as well as other towns in the area. The local newspaper is called The Mourne Observer. Newcastle is located at the foot of the Mourne Mountains. It resides on the east coast of Northern Ireland. Newcastle can be found in County Down within the province of Ulster. Newcastle is built around the Shimna River. 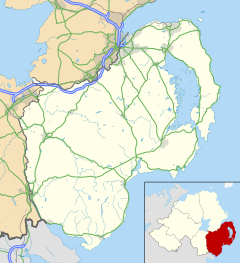 Newcastle, in relation to other settlements is situated 19 kilometers from Downpatrick and 51 kilometers from Belfast. Poet and writer, Richard Rowley (1877–1947), lived in Newcastle in later life. During World War II he founded, and ran from his Newcastle home, the short-lived Mourne Press, which failed in 1942. The poet's Newcastle home, Brook Cottage, has been demolished. In Newcastle his name is remembered through the Rowley Meadows housing development and the Rowley Path, which runs along the southern boundary of the Islands Park. Eddie Polland, professional golfer, winner of four European Tour events. Rigsy, broadcaster and popular DJ, was born in Newry but brought up in Newcastle, where his parents still live. Award winning children's author Martin Waddell, although born in Belfast has lived most of life in the town. ^ 2001 annual report in Ulster-Scots North/South Ministerial Council. ^ St Patrick in County Down (Ulster-Scots translation) Archived 3 September 2012 at the Wayback Machine DOE. ^ "About Newcastle". Newcastle Lifeboat. Archived from the original on 23 October 2014. Retrieved 16 October 2014. ^ Forde, Hugh (1928). Round the Coast of Northern Ireland: Antrim Derry, and Down. R. Carswell. p. 203. ^ John Cooke (M.A.) (1902). Handbook for Travellers in Ireland. E. Stanford. p. 87. ^ Meginness, John R. (1891). Origin and History of the Magennis Family: with Sketches of the Keylor, Swisher, Marchbank, and Bryan families. Heller Brothers Printing Co.
^ O'Sullivan, Aidan & Breen, Colin (2007). Maritime Ireland. An Archaeology of Coastal Communities. Stroud: Tempus. p. 211. ISBN 978-0-7524-2509-2. ^ a b c d e "Key Statistics for Settlements Tables" (PDF). NISRA. Retrieved 5 March 2014. ^ "Newcastle Promenade Redevelopment wins Arts Council-sponsored Civic Trust Award". Arts Council of Northern Ireland. 5 April 2007. Retrieved 16 December 2014. ^ "Northern Ireland's crime rate now at a 15-year low". BelfastTelegraph.co.uk. ISSN 0307-1235. Retrieved 10 May 2018. ^ "Links Courses - Links play in Northern Ireland is the closest to extreme sport golf can get". Discover Northern Ireland. Retrieved 13 May 2014. ^ Ireland. Lonely Planet. 2007. p. 628. ISBN 9781741046960. ^ "Built Heritage of Mourne AONB". DOE NI. Archived from the original on 16 December 2014. Retrieved 16 December 2014. ^ Hayward, Richard (1946). In praise of Ulster. W. Mullan. p. 122. ^ J. P. Mallory; T. E. McNeill (1991). The archaeology of Ulster from colonization to plantation. Institute of Irish Studies, Queen's University of Belfast. p. 63. ISBN 9780853893523. ^ "Off The Beaten Track, Bloody Bridge River". BBC Blueprint. BBC. Retrieved 13 April 2014. ^ "St. Mary's Primary School". Retrieved 16 December 2014. ^ "Submission to the Inquiry into Shared and Integrated Education" (PDF). Northern Ireland Assembly. Archived from the original (PDF) on 16 December 2014. Retrieved 16 December 2014. ^ "Newcastle station" (PDF). Railscot – Irish Railways. Retrieved 19 November 2007. ^ "Historic Building Details - Tower at former railway station, Railway Street, Newcastle". DOE NI. Retrieved 16 December 2014. ^ "Richard Rowley". Ricorso. Retrieved 4 March 2009. ^ "Richard Rowley". Ulster History Society. Archived from the original on 9 May 2008. Retrieved 4 March 2009. ^ "Places That Time Forgot". Sea View Apartments. Retrieved 4 March 2009. Wikimedia Commons has media related to Newcastle, County Down.